The Costa Mesa Planning Commission meeting Tuesday night was an interesting event. "THE MOUTH" SPEAKS - WHAT'S NEW? First, The Mouth From Mesa North stood at the speaker's podium and gave the commissioners a pep talk - God save us all! Among other things, he encouraged them to "call in some chits" with their development buddies and encourage them to come to Costa Mesa to do projects. I have to agree with one thing he said, though, when he told the Planning Commissioners that they were not getting good communication from the City Council. That fact was painfully obvious during the city council meeting last week. 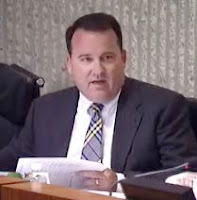 In the "commissioner comments" section, Chairman Jim Righeimer spent a long time addressing what happened at that meeting, when the council rejected the commission's proposals on neighborhood parking and related ordinances. "WE WORK HARD FOR OUR MONEY"
During his long speech he mentioned that someone had asked him why none of the commissioners were at the council meeting to address the issues in question. He told the audience that "these people work very hard up here", meaning his fellow commissioners, and that they all have full time jobs and have to work their schedules around to make the commission meetings. Yeah, OK, Riggy, but that's what you all signed on for. Personally, I don't think it's appropriate for a sitting commissioner to come before the council and plead his case on an issue that has been appealed to it. The commission had it's chance to make it's views known during their deliberations. They've had the opportunity to compose their "findings" on the issues. Those deliberations are clearly recorded and the staff presents to the council their summary of the circumstances. I think what's happening is that Righeimer likes the taste of power he has as Chairman of the Planning Commission. I think he's trying to show us that he's a "mayor-in-training". Now that he's in control of his little domain he's showing even less patience than in those days when former Chair Donn Hall would take him to the woodshed for his antics. Now there is no one to rein him in, so he just continues to go off on whatever tangent he feels is appropriate. Young Chris McEvoy, who ran for city council last fall, recently wrote in the Daily Pilot that he thought Riggy is bad for Costa Mesa. Even though I voted for Righeimer in the last election, I must agree with McEvoy. Riggy demonstrates a tendency to just charge ahead like a bull in a china shop. As each meeting passes it becomes much more clear that his vision for Costa Mesa is not shared by a large portion of the population, including many of the council members. I think it's time for the council and the Righeimer-led planning commission to hold a joint study session to be sure they all are on the same page. If they don't, Riggy is going to continue to try to form city policy and direction on his own. THE ALTERNATIVE - RIGGY OUT! Of course, there is always the alternative - alluded to by Righeimer during his speech - for a majority on the council to ask him to step aside and appoint someone else to the commission. That's not going to happen, though. Riggy is too tight with the Orange County Republican Party hierarchy and members of our council majority are beholden to the OC GOP for their political fortunes.